A beautiful calm early Spring day at the venerable Hodogaya Country Club greeted the sixteen C&O players on Saturday March 23rd. This time we were graced with a guest – David Jones from the London wine merchant Berry Brothers, as well as the welcome participation of one of our lady members, Carolyn Macdonald. Everyone was delighted to welcome back to active golfing duties Terry Nakamura, who acquitted himself extremely well on the day. Four fourballs, two ‘In’, two ‘Out’, eight Oxonians, seven Cantabrians; the stage was set for another close battle for not only the prized individual trophy (defending champion: Yoshi Kawamura) but for the ‘varsity’ match based on the top four scores from either University. Our guest David Jones, a smooth swinging 3 handicapper from The Berkshire, actually posted the best score on the day, with a fine 75 gross. But the individual honours went to Simon Dalby whose 76 was enough to win the day. The Varsity match was finally won by Cambridge thus halting a run of Oxford success. A very enjoyable day was had and we all look forward to the Autumn meeting. Many thanks to Steven Thomas for organizing the day. Oxford players: Peter Sato, Terry Nakamura, Charles Postles, Yoshi Shimizu, Tomo Imai, Steven Thomas, Yasuzo Takeno, Alex Miller. Cambridge players: Simon Dalby, Peter Itoh, Jim Weeks, Alastair & Carolyn Macdonald, Yoshi Kawamura, John Sunley. On February 5th, 2013 fifty-two members of the C&O Society, including two of our most senior members, Hugh Wilkinson (King’s Cambridge, 1946) and Doreen Simmons (Girton Cambridge, 1950), and seventeen guests attended a dinner in the Tokyo Club to welcome, as our newly appointed President, the new British Ambassador, HE Mr Tim Hitchens (Christ’s Cambridge, 1980) and his wife, Sara (Christ’s Cambridge, 1981). 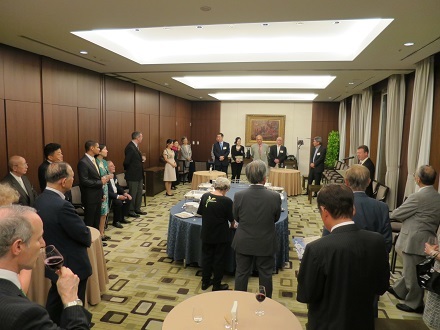 We were also honoured with the presence of HIH Princess Takamado (Girton Cambridge, 1972), who gave the toast to our new president, after which we were treated to a splendid six-course dinner impeccably prepared and served by the Tokyo Club staff. A number of those present recalled Tim and Sara Hitchens from an earlier posting to Tokyo, when Tim, as a more junior member of the British Embassy staff, reported to another Cambridge graduate and staunch member of the Society, who subsequently became British Ambassador to Japan, Sir Stephen Gomersall. 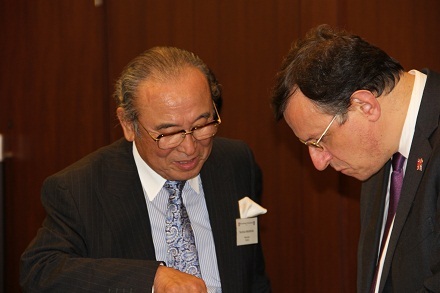 By a happy coincidence Sir Stephen happened to be in Tokyo on a business trip, and so was able to attend the dinner. In his after-dinner acceptance speech, Tim Hitchens spoke fondly of his time at Christ’s Cambridge. He had had the privilege of spending one of his years in the very rooms occupied centuries earlier by the blind poet, John Milton, as evidenced by words crudely carved on one of the room walls – “John Milton lived here”. It was, of course, at Christ’s that Tim and Sara met. Posted in Event Reports | Members only Submitted by huw.williams on Wed, 2013-02-06 09:00. The 2012 C&O Autumn Golf Outing was held on October 20th; it was a beautiful, sunny autumn day - most welcome to all golfers after the abnormally hot summer endured this year. The course was Fuji OGM Ichihara GC; that morning, the traffic on Aqua Line was not so bad, resulting in the fact that everybody arrived without any frustrations from a long drive. A total of eight people joined: four each from Oxford and Cambridge. While the Oxford players tried their best, on this occasion Cambridge team won the University Match by a slim margin of just 4 strokes (331-327). The historic record now stands at Oxford 23 vs. Cambridge 18. In the individual competition, Yoshihiko Kawamura won the C&O Trophy for the first time with a solid score of 97 gross and 77 net. The new Champion said that even though he was enjoying a high handicap, he did not expect to win at the tournament at all, because his driver and fairway woods had not been stable for the past months. However, he was very much helped by an excellent caddy who found his ball even in the bushes and gave effective instructions on the greens. In addition, his game benefited from the enjoyable company and friendly encouragement of his playing partners, Charles Postles, Steven Thomas and Jim Weeks. On such a wonderful Kanto autumn day, all participants enjoyed the tournament, and promoted our friendship. We promised to get together for the next C&O Spring Golf Outing at Hodogaya CC, scheduled for March 23rd 2013. 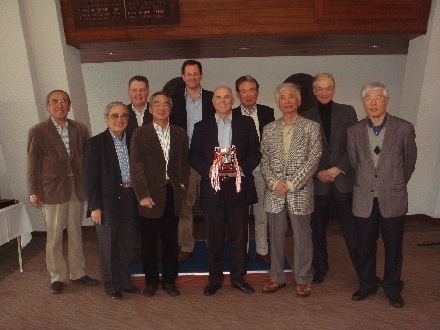 Mr Teruhisa Nakamura (Worcester Oxford 1964) retired from the C&O committee at the Triennial General Meeting held on April 20th 2012, having devoted himself tirelessly to the day-to-day running of the Society for more than 30 years. 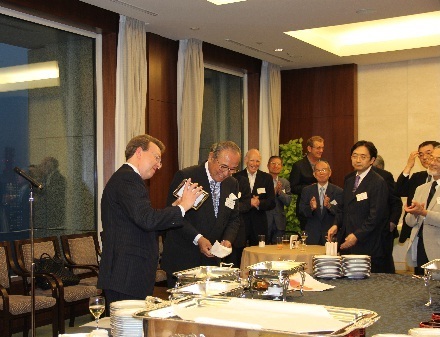 As a small token of our gratitude for his dedicated service to C&O, we planned a Gokurosama Party (as distinct from a farewell party) in his honour at Kojunsha in Ginza as our main event for June. Unfortunately for us, but happily for Terry, just after the notice for the party was distributed to members, he received and accepted an invitation from the Chancellor and Vice Chancellor of Oxford University to the 2012 Encaenia on June 20th. 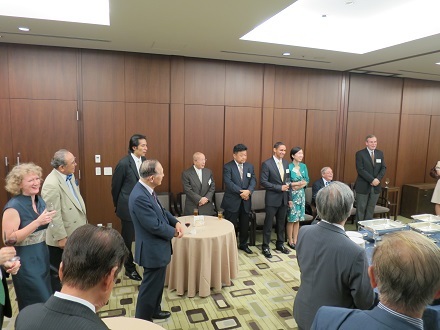 The Gokurosama Party was, therefore, postponed until July 6th when, thanks to the kind arrangements of Mr Buhei Okumura (Trinity Cambridge) and his wife Yuko, it was held at Mitsubishi Club at the top of the Mitsubishi Shoji Building in Marunouchi. The text of the speech Terry prepared for the event constitutes a valuable historical document; it may be viewed on the history page of this site (or click here for the full text). Posted in Event Reports | Guests welcome Submitted by huw.williams on Fri, 2012-07-06 09:00. 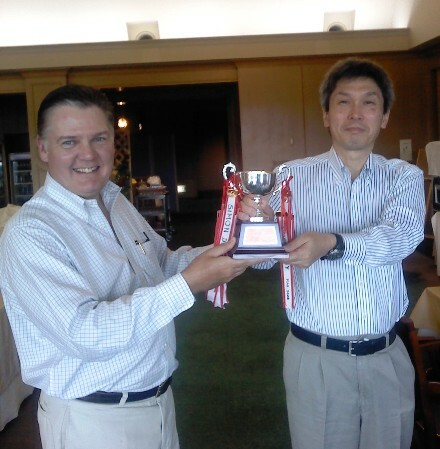 Hodogaya Country Club once again hosted the C&O for their Spring tournament. This splendid venue – just thirty minutes saunter down the Tomei – remains our favoured ‘home’ ground. Unfortunately, despite the best efforts of our stalwart golf organizers Steven Thomas (just elected a member at Hodogaya – congratulations Steven) and Terry Nakamura, Tokyo’s recalcitrant Spring weather failed to deliver which possibly explains the rather slim turnout on this cool, damp March day. The ten hardy souls that showed up however greatly enjoyed the day’s golf. In such an august setting, grim thoughts prompted by any three putts on the notoriously slick greens are almost invariably banished by the beauty of the plum blossom, the professionalism of the caddies and the warmth of the camaraderie. Oxford have enjoyed a substantial lead in the ‘University match’ rankings but this time it was Cambridge’s day with the light blues occupying all of the top four slots and thus prevailing by the margin of 44 strokes. Simon Dalby won the individual with a polished round of 72 gross. Peter Itoh came second and Alastair Macdonald third. Posted in Event Reports | Members only Submitted by huw.williams on Sat, 2012-03-24 00:00. Saturday 8th October saw the C&O Golfers group returning to Shin Numazu CC in Shizuoka for the first time since the Centenary Golf Outing in 2005. Our host once again was SNCC member Tomo Imai, who did an excellent job of setting up all the arrangements for the day. With a number of regular C&O golfers otherwise occupied, for this visit we numbered a modest 10 players, 6 from Oxford and 4 Cambridge. Those in attendance were able to enjoy the golf course in excellent condition, despite a recent period of sustained wet weather. The natural beauty of the course, its surroundings and views over Suruga Bay were remarked upon by all, and surely took our minds off the occasional errant shot or putt. After the long trip down from Tokyo, the morning nine saw a slow start for most players, although Cambridge stalwart Simon Dalby raced out of the blocks with a one under par 35. A very good lunch of local fare was then enjoyed, along with a glass of beer (or sake for Imai-san) to fortify us for the remaining 9 holes. Indeed 8 players improved on their morning efforts in the afternoon. When we tallied the results over the traditional post-game party and prize-giving, Simon Dalby was declared the winner with an excellent gross 71, net 69. Trailing by just two shots was Yasuzo Takeno, who was the only other man to play to his handicap on the day, with Alastair Macdonald and Alex Miller close behind in joint 3rd place. In the Varsity match, Oxford came out as winners by a seven stroke margin, and the historic record now stands at Oxford 23 and Cambridge 16. 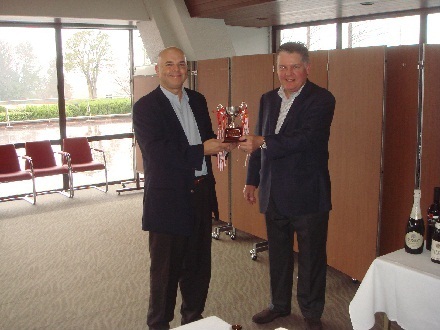 Our sincere thanks to Tomo Imai for hosting us at Shin Numazu CC, and to the Club for their warm welcome and gift of excellent locally-produced yoghurt. The next Spring 2012 C&O golf is planned to take place on Saturday March 25th at Hodogaya CC (subject to confirmation). The golfing members of the C&O Society were all the more pleased to be able to get together at venerable Hodogaya CC on 16th July for our summer outing. Indeed this golf day had by necessity been rescheduled from the original spring time date, just after the tragic events of March 11th. Fourteen members and two guests braved some particularly hot and humid mid-summer weather to enjoy the immaculately prepared Hodogaya course and its ever-swift greens. Despite the tough conditions, 10 players broke the 100 mark and 5 recorded scores of 90 or below. Scoring apart, it was an ideal opportunity to renew old golfing friendships, both on the golf course and at the post-game party. At the end of the day, the top placings went to James Lawden in 4th spot, Steven Thomas in 3rd, Ambassador Masaji Takahashi in 2nd place and with Hodogaya member Peter Itoh a clear winner with a net score of 70 (for which his reward was the C&O Trophy and a handicap reduction to 18). In the Varsity match (4 best scores), a rather strong showing by Cambridge gave them an easy 10 stroke win, with the historic totals since 1989 now Oxford 22 and Cambridge 16. We are already planning the next outing, to Shin Numazu CC on October 8th. Next year we will revert to the regular cycle of Spring and Autumn Golf Meetings.